Projected changes to the climate over the coming centuries will radically restructure many of our forests throughout the world. We read the worst case scenarios in the news: the total loss of forest systems due to drought, wildfire, and insect outbreaks. But my research on forests and climate change over the past 20+ years has suggested that forests are not monolithically at risk due to climate change. There is a huge variation in potential responses to climate change, not all of it bad. When considering future investments in maintaining forest health, we may need to consider a broad ‘landscape triage,’ whereby we intentionally choose which landscapes to save, which to leave to natural processes, and in which to invest immediate care. Fire mortality, Strawberry Mountains, central Oregon. For example, forests in the northeastern US appear to have high natural resilience to climate change. What makes these forests naturally resilient in part is their diversity. Diversity encompasses the number of species, their genetic variation, and the broad range of their functional attributes. Landscape connectivity (the capacity for organisms to access the various components of a landscape) and evolutionary adaptations for change also contribute to their natural resilience. This resilience was evident following agricultural abandonment across huge areas of the northeast, particularly in New England. The forests quickly rebounded and today astound visitors with their extent and apparent health. And my research on climate change in the midwest and northeast suggests that we should expect these forests to grow faster and sequester more carbon under climate change. That’s not to say that other threats don’t exist: over-abundant deer populations have decimated natural regeneration in many areas. Non-native insects are wiping out many important tree species. And continued development threatens to severely fragment and degrade these forests. But relative to these other threats, climate change may not be a primary existential threat. In contrast, other areas are severely threatened by climate change, to the point that forests may not persist without intensive management interventions. For example, scientists have projected that some forests in the southwest may never return following wildfire due to projected droughts and associated wildfire triggered by climate change. Should we invest the enormous resources, primarily in tree planting, necessary to maintain vulnerable forests? Will these actions ever be sufficient? Newly planted seedlings are particularly vulnerable to drought and wildfire. Whitebark pine mortality, Mt. Hood. Between these two extremes are forests that can be maintained in a healthy condition despite climate change. These are forests where, ‘managed resilience’ can make all the difference: careful intervention can prevent the worst outcomes. In these areas, management actions can help ‘bend the climate curve’ away from negative outcomes. These actions will vary widely by location but may include fuel treatments to prevent crown fires, thinning to reduce insect mortality, planting a broad species mix when planting is required, even potentially including facilitated migration in anticipation of an altered climate. These are areas where our scarce resource management dollars can make the greatest difference. My research uses large-scale simulations to project potential forest futures throughout the world. Recent research suggests that the Coast Range of Oregon has high natural and managed resilience. Predictable and substantial precipitation grants the former and no climate projection suggests a sustained decline in rainfall (although drought frequency may increase). An extensive road network and an institutionalized capacity for replanting vast acreage provides the managed resilience. Roads are often regarded as a net detriment to forest health; however, they also facilitate fire suppression by enabling people and equipment to quickly access a fire. Although our research is ongoing, I suspect that eastern and southern Oregon fall into the middle ‘bend-the-curve’ category: climate change has the potential to unleash unprecedented wildfire and insect outbreaks. At the same time, careful preparation and the capacity to quickly react and adapt can prevent large-scale forest loss. Landscape triage is not an attractive future. It would be better not to have make difficult decisions. It would be better to have unlimited resources to save every forest. I fear though that this future will be a reality sooner than we expect. The good news is that science is delivering the forecasting tools to understand how risk is spatially distributed. And we continue learning how we can bend the curve to a better future. We must next decide to do so. We can’t simply wait and hope the worst doesn’t happen or wish that every landscape will simply bounce back when the crisis is over. This crisis will not end soon and action is needed now. Immediate actions will include funding the US Forest Service to reduce fire risk, not just fight fires. We can advocate for more forest restoration funding to enhance natural resilience. We can give land managers greater flexibility to achieve the long-term goals of ensuring forest health. Most of all, we need to stop digging a deeper hole: we all need to reduce our carbon consumption. Climate change is happening now. At the same, there is much we can do to limit the consequences. Every degree matters. Robert Scheller is a professor at Portland State University where he teaches forest ecology and related courses. He received his PhD in Forest Ecology from the University of Wisconsin. His research focuses on forest landscape change: how forests have changed, how they will change, and why it matters. Specifically, his research examines how forest management and natural disturbances generate or reduce forest health, specifically in regards to climate change. His research is data-driven and deploys advanced technology to forecast landscape change. These forecasts inform forest policy regionally and globally. He has published more than 60 manuscripts and book chapters and otherwise enjoys the natural and cultural amenities of Portland. After living 4 decades in Oregon, one truth above all comes through on the subject of Oregon’s forests, that is, they are “managed” as tree farms and not ecosystems. A case in which the cure is worst than the disease. The forest management plans of the feds and the state include allowable yields, roughly translated means clear cutting forests, and leaving one or two sickly trees standing per acre as a conservation measure. It get worse, clear cutting into watersheds is standard practice with no more than a 25 foot set-back from the water line. With the diversity and resilience of the natural system eliminate, and the USFS and Oregon’s agency equivalent both serving as agents for the wood products industry, there is little hope for reform while engaging in monoculture forest re-planting practices of cloned evergreen seedlings, mostly Douglas Fir. Gone, for the most part, is Oregon’s once rich eco-diverse and resilient forest habitat, in it’s place are miles of “managed” tree farms. The so-called forest experts (I’d put the author in this group) have been mostly educated in the equivalent of factory schools, sponsored by the wood products industry – giving silviculture a whole new meaning. Also gone are Oregon’s (and the PNW) once majestic old growth forests and trees, cut down in their prime in the 19th and 20th centuries. Fast forward to the present, and add in the unprecedented carbon loading of the atmosphere and oceans, global temperature rise, the introduction evasive species and climatized inserts, and you have the perfect storm for Oregon’s forest demise. Yes, global warming is doing its worse to the remaining global forest systems, but efforts to migrate the harmful effects in Pacific Northwest are now mostly muted by centuries of treating trees are timber and not part of a larger and irreplaceable ecosystem. Care to expound on the “need to reduce our carbon consumption” and the link to “Climate change”? In the real world, there is no proof, and nothing even pointing to any validity in your statement. Oh, there is evidence that CO2 did have its effect on planetary temperatures … the absence of CO2 in Earth’s atmosphere would be catastrophic to us … but, the addition of CO2 to what is already in our atmosphere … there is no evidence of that resulting in warming. None. The first 20 ppmv had a large effect. i could not comment on the global warming on the correct blog sorry. i call BS on the co2 gas cause. first off -black and white photos since the 1840’s of the sun (all taken with the same style telescope ie refractor), show a 30% difference in sunspot size ie increasing- and the curve is parabolic. and if fossil fuels were to describe the global warming, what caused the global warming when the dinosaurs were here, or 10 and 100 000 years ago when the ice ages ended. those effects were much greater than what we see now. they say for example that the mississippi river was like 10 miles wide from the melt. and quess the —k what, exxon mobil was not around. all of these global warming freaks are just lazy sons of —–es and want government grants. why , cause they cant earn money.they just want to support all the proinflationary handout mentality that has been failing this country since we pulled gold out of circulation in 1933 ! I’m sure that you will read, or hear, that the sun has already been ruled out as a suspect in this case. The total solar irradiance (TSI) … the supposed, sum-total of all wavelengths of light, available to strike the earth at 1AU distance … does not have a variation of magnitude to equal what is guessed at, as the magnitude of “Global Warming” energy imbalance. The TSI, however, is too broad to measure variations in more narrow, spectral ‘slices’ of the sum-total. Then, there is the variation of the magnetic component … which isn’t even noticed by the TSI measurement instruments. The magnetic component influences the flux of cosmic rays reaching the earth’s atmosphere. Cosmic rays directly influence the formation of cloud nuclei. (Recent studies involving CERN prove this) Clouds cool the earth by modulating the albedo (even the IPCC agrees on that one). A proxy for cosmic rays is the formation and deposition of 10Berrillium on the surface of the earth. The match-up between 10Be and global temperature is more closely associated, than is the atmospheric concentration of CO2. go to archive , then movies and you will see how the dates of hurricaine katrina and the recent louisiana flood directly coincide with the images. in fact on 8-11-2016, the day before the rain started, the soho camera could not even pull a full image ie blacked out the right side of the screen. we all have to make our own decisions. regardless if the “scientist does not have a BS in chemistry, physics, or math ie prior to graduate work, i would be highly suspect of ANY conclusion drawn from linear logic. you see with most life processes, non linear relationships exist. but when you compress time ie the x axis, all functions appear linear ie over a short period of time. when you consider prior events ie ice ages and their much greater magnitude than anything going on now, you have to question simple wishful rhinking (grant sucking /tax dollar wasting types). most of these scientist lack an education in real science ie the basics of chemistry, physics , and mathematic ie as a undergraduate degree. they have life science degrees of environmental science degrees. they dont have the basic core science knowledge to even do this sort of research. but yea they have to agree with the crowd to get grant money and keep their job . go to the soho site and watch the movies of the sun in blue and compare to makor weather events ie hurricaine katrina and our 1000 year flood we had last week. One of the databases that it has, is the “Keeling Curve” … the Mona Loa atmospheric CO2 concentration. As you know, the derivative reduces the concentration measurement data into a “rate of change” signal. These two plots match up very well. One is from the Hadley centre, of the global temperature in the tropics. The other is the DERIVITAVE of the Keeling curve (the CO2 plot, as measured in Hawaii). The website, “wood for trees” just offers the ability to plot data … An increase in temperature causes CO2 to be released from dissolved CO2 in the ocean waters… meaning that it is the change in ocean temperatures that causes the concentration of CO2 in the atmosphere to vary. Warming oceans drives out dissolved CO2. If you magnify the time-scale, you can see, CO2 concentrations lag temperatures. Scaled-to-match relationship between measured CO2 and HADcrut4 tropics temperature. An expanded view of the derivative of CO2, this time, plotted agains three temperature series. 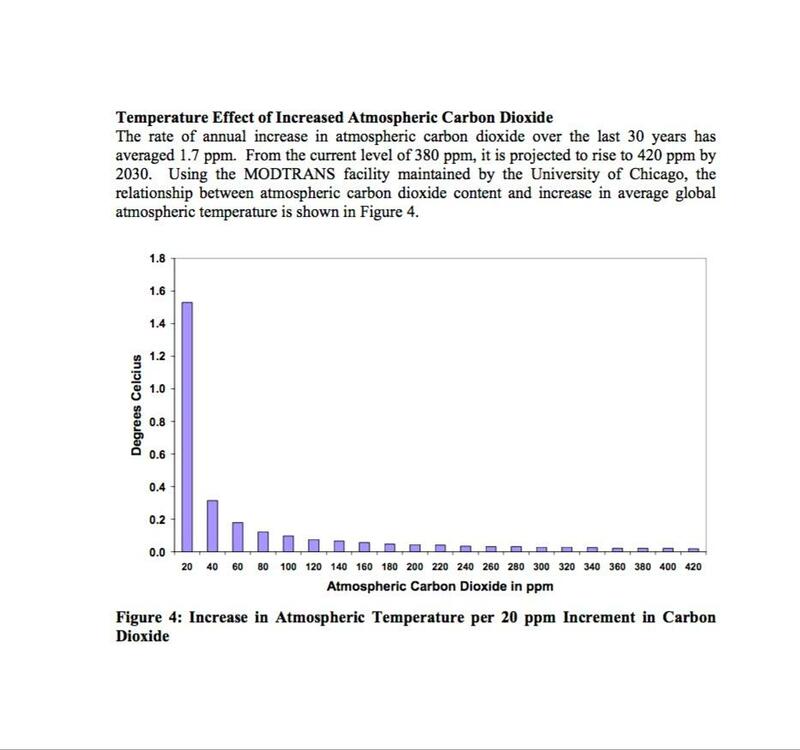 The atmospheric concentration of CO2 lags temperature… this indicates that temperature increases cause CO2 outgassing. the CO2 curve lags the temperature. Thanks for the article Dr. Scheller. It will be interesting and challenging to manage our forests in the face of this warming future. I’m a forester in central British Columbia where we are constantly challenged by changing climate. Winters are much different: much shorter with less snow, fewer cold snaps, more rain, more “warm snaps” of above freezing temperatures. Summers in the region where I practice (Okanagan/Cariboo) are often wetter than previous norms but with periodic extreme drought and forest fire seasons. The Mountain Pine Beetle has come and gone, but we still face an increase in less obvious pests like spruce and Douglas-fir bark beetles, stem rusts, and so on. One forest entomologist here has predicted that in about 40 years we’re in for another Mountain Pine Beetle outbreak, but this time it’ll be in plantations, because a) we have vast landscapes of pine plantation, b) winters will be that much warmer, and c) this bark beetle is adapting to reproducing in smaller and younger host trees, and d) our pine plantations grow fast in open conditions and reach critical diameters sooner. Meanwhile, spring comes earlier and fall lasts longer, throwing off the cycle of dormancy. Interesting too, scientific studies like that of Penn State ecologist, Mark Abrams, who suggests that eastern US forests have become more vulnerable to drought, and that even one drought in a decade can offset all the good years of cool wet summers. Challenging times for foresters. Thanks again! Thanks for a good lesson in forest management, etc. I had known of the variance that occurs with forests around the country. The bottom line remains the same: reduce our carbon footprint asap. The details about how to intervene, or maybe not, in some forests is very instructive. I have a friend living in Oregon with whom I will share this. As a longtime UCS member, I stand ready to support efforts to do the first of these steps. I hope UCS will continue to publish this kind of info about local forest management and assist these efforts where it can prove helpful.